I wasn’t sure I was going to survive today. It’s been a crazy busy week and I just didn’t get myself prepared physically or mentally for Valentine’s Day. As of 5pm last night, when I was finally hitting up Meijer for supplies, I still had no idea how our Valentine’s Day party was going to go. I knew I was going to buy bags for the kids to decorate and to help get cards passed out smoothly. Of course, seeing as that was the only thing that I knew I was going to get, I forgot them. Partner teacher saved the day once again! I also knew I only had about an hour and a half to fill with fun. Do you know how long an hour and a half feels when you have absolutely no clue what you are going to do? It feels like an eternity, that’s how long. As I was walking through the store I found this mixed bag of Skittles and Starburst. 40 pieces of candy in one bag. I only have 18 kids at the moment, so I thought it’d be perfect. I could give each kid one of each. Wanna know the best part? I opened up the bag and there were 4 Skittles. 4. And 26 Starbursts. Clearly, the bags are a mix and I wasn’t sure if it’d be split an even 20:20. But, 4:36. Not the kind of ratio I was hoping for. 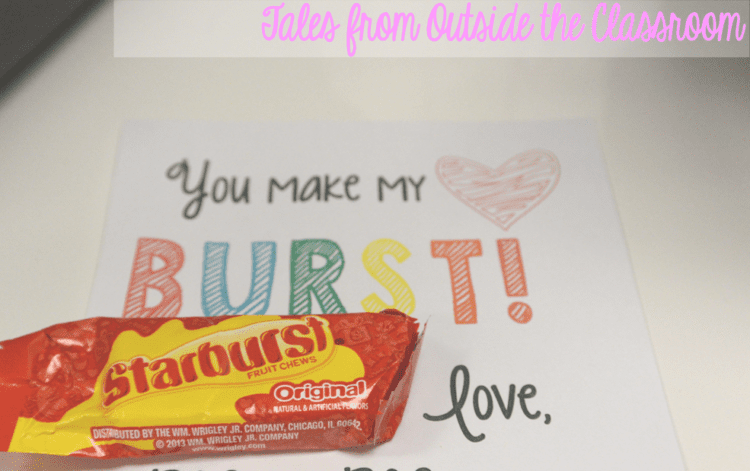 I did decide to go with the Starbursts and go with the *burst* idea. I’m sure I need to give someone credit for this idea. I’m sure I saw it on Pinterest at some point and it wasn’t my own genius moment. However, I’m also sure that it didn’t happen anytime within the last few weeks so I have no idea who to give credit to. So thank you, witty candy Valentine creator! Because I waited till the eleventh hour, I didn’t have time to go to crafty places looking for ideas. Probably a quick look on Pinterest would have given me an idea or two I could have used and found at the store. Of course I didn’t do that, though. As luck may have it, I actually had an idea as I was walking through the store. Kisses! Foil! Easy peasy! I made a quick writing sheet using my free Valentine’s Day borders. Then each student got a piece of foil that they cut a triangle from and they chose a piece of scrap paper to make the little flag. They then wrote a letter to whoever they wanted to give a “kiss” to. They loved it! Even my most reluctant writers enjoyed writing letters to people in their lives that they could take home to them for Valentine’s Day. A couple kids were even excited that they had a Valentine’s Day present for someone. So many of them were just so sweet and heartfelt! I loved this one. “You are the best mom I had ever had in my intire lif no matter what happens.” So sweet and so funny! All in all the day went much more smoothly than I had anticipated (Oh, thank goodness!). Everyone came in and left as such sweethearts today and I got a few more hugs than usual. I hope your day was just as great and you’re spending it with all the ones you love, both in your classroom and out! You can get both of these Valentine’s Day freebies, as well as other freebies, by signing up for my newsletter. After sign up, you’ll be given the link and password to my exclusive newsletter freebies. To sign up, just fill out the form below.